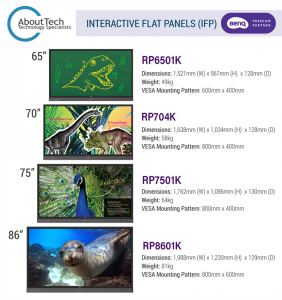 AboutTech is proud to team up with BenQ as an Interactive Flat Panel (IFP) Premium Partner. 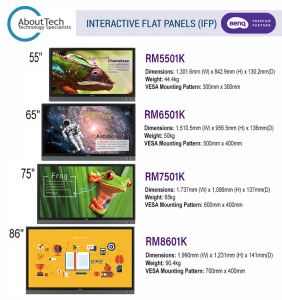 BenQ have recognised AboutTech’s outstanding technical knowledge and product support and have provided unrivalled access and support for our BenQ IFP customers. What does this mean for your school or business? As you can see with the graphic below, there are a range of sizes to suit your requirements. All models feature up to 20-pt touch, AG+ anti-germ screens, EyeCare technology, in-built sound bar for improved audio performance and an inbuilt Android OS with PC Free Whiteboard Software. Contact one of our friendly staff on 1300 881 926, use our contact form at the bottom of this page or email info@abouttech.com.au to discuss your requirements.